Scott and I consider ourselves creative parents, always with a project on the go. Our children are naturally keen to create as well, and because of their desire to tinker, draw, paint, and build, we enjoy gleaning loads of inspiration from other creative educators. I myself have a well known love for collecting beautiful texts that provide activity after activity for our children (and their parents!) to engage in. Writing centre ideas, activities for outdoor play, tinkering, creating stories, dramatic play, arts exploration, and more. While so many ideas can be found in the world wide web, there is something magical about holding a book in your hands. It is the joy of leafing through pages of beautifully photographed images of children engaged in exploratory experiences. And then making note of your favourite activities that you will introduce to your child. If you are looking for such inspiration to provide creative opportunities for your children, look no further. I have compiled a list of our (current) top 14 books that we either own and love or are longing to add to our shelves! If you are looking to provide rich learning opportunities at home and need some guidance and inspiration, this is the book for you! Mariah Bruehl does an amazing job of not only describing the “how” in engaging young learners, but the “why” as well. She provides information on children’s development in writing, reading, mathematics, science, art, and more. This has been my go-to resource in setting up learning spaces, adding flair to our writing activities, and freeing us to do open-ended art. You will also find printables to support the lessons throughout the book. For children who love the outdoors, this is the creative book to have. Renata Fossen Brown takes children through the very basics of gardening, beginning right at the parts of plants, annuals vs. perennials, and how to plant. The book is broken up into six units from “Garden Basics” to “Enjoying Your Garden.” Your child will learn how to make gardening essentials such as seed tape, rain gauges, and compost bins. There is also a section on “Garden Art!” With gorgeous photographs throughout, this book will be sure to delight the garden enthusiasts in your home. Story telling is often the product of our children’s creativity. From sunup until sundown, our children are immersed in play that evolves from one dramatic scene unto the next. Taking bits and pieces from books, television shows, and life experiences, they recreate and reinvent stories to share with one another. This book by Emily K. Neuburger provides 40 “craft projects and activities to spark children’s storytelling.” You will be working together with your children to make story stones, theatres, and story maps. With so many great ideas, your literacy time as a family will be enriched for sure! If you have been looking for a resource to support art exploration at home, consider investing in this book. Broken into six units, Susan Schwake first provides a “Master Materials List” for your art space as well as methods in handling materials in your ‘studio.’ Then, based on your child’s interests or ability level, you may choose from five types of art: drawing, painting, printmaking, sculpture, and mixed media. I love how she begins by describing the littles in our lives: “They are the ones who – if you listen carefully and provide them with opportunity – will surprise you with their curiosity, creativity, and ability.” I love how much truth she packed into that one little statement! As your little ones grow and complete the suggested projects in “Art Lab for Little Kids,” find another 52 beautifully laid out ideas in this other book by Susan Schwake. 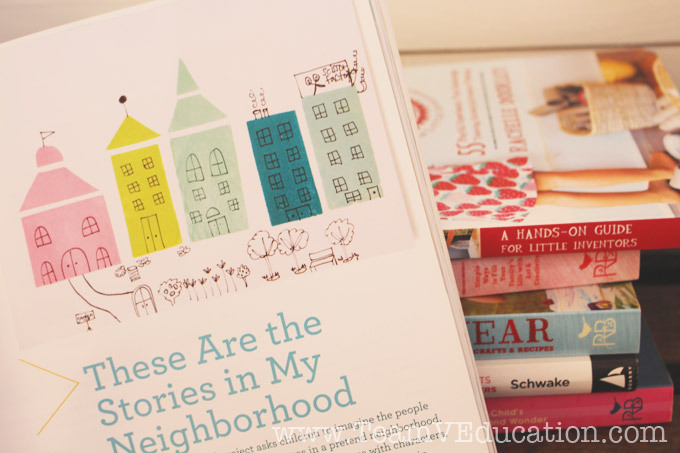 She shares how these lessons have been collected over the course of twenty years of teaching, and how it all began at home at her kitchen table. “A hands-on guide for little inventors” – what a great description for this amazing book! In the introduction, Rachelle Doorley describe tinkerers as “those who take machines apart in order to figure out how they work, and then use that knowledge to innovate and build their own machines.” She is careful to explain the art of tinkering and its benefits in the lives of children. I especially love how she has taken the first chapter of her book, a whopping forty pages of information, to set the reader (i.e. parent, teacher, caregiver, etc.) up for success. When I was through with that wealth of knowledge, I felt ready to attempt the activities in this book and to allow our children the freedom to explore in their work. You will love the philosophy behind this style of learning and how it will engage the minds of your children. 7. 101 Kids Activities that are the Bestest, Funnest Ever! This book is all about play and having fun! Holly Homer had me hooked within the first lines of her book: “Play can take an ordinary day and make it a favorite day. It doesn’t require equipment, money or planning. It can fill a moment. It can fill a day. And when intentionally sought out, it can fill a life.” Yes! Peruse the preview online because you will be drawn in just as I was. For that day when you need a quick activity to pull all of the children together, this is your resource. Because at the end of the day, I think that everyone could use a fruit necklace to munch on! Oh science – what better way to explore and to be creative, than with science. Investigation and play are at the heart of these activities. Contents in this book include kitchen chemistry, physics and making things move, exploring the world, and the human body. Some activities require adult supervision, while others do not. Each lesson provides the supplies needed as well as a science question to get you started. I feel that this is a wonderful way to introduce science into your home in a fun and exciting way. Since we are on the topic of science, click through to have a look at Asia Citro’s amazing book! Our family absolutely loves exploring the outdoors and finding new ways to engage in our surroundings. This is a fantastic collection of activities to help children discover and interact with what is outside their home. Lessons providing hands-on learning for topics such as the water cycle and soil will engage your children, as will the many outdoor arts and crafts ideas. With over 55 science and art activities to “reconnect children with nature,” you will be busy all year long! More science! I love how science and art both have their own creative elements. As an educator, I am thrilled with how Asia Citro organized her text with “explore,” “experiment,” and “challenge” activities. This is a resource that will support you for years to come. Included are eight different chapters: plants and seeds, water and ice, mold, bacteria, and fungus, engineering, food and candy, baking soda and vinegar, environmental science, and living things. Experiments are posed as a question, and little scientists are asked to “make a guess.” They then run an experiment as outlined in the lesson and collect data throughout the duration of the experiment. Real-life applications, suggestions from other children, and extensions provide enough variation that children of many ages can perform these activities. Challenges and exploration activities are just as engaging and will be sure to inspire your creative children! 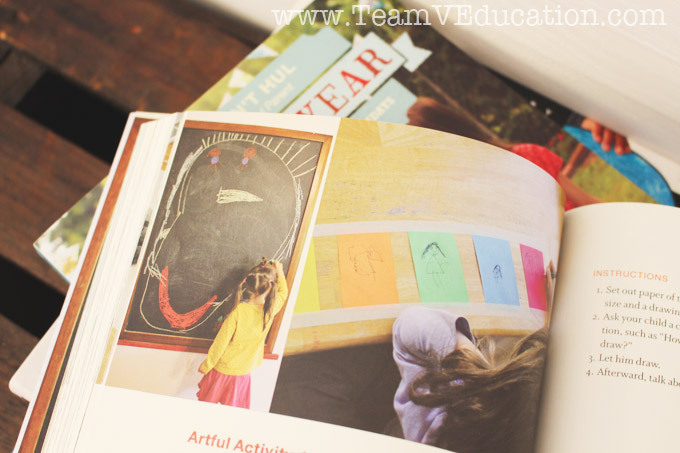 This book is all about “saying yes to art” and “artful parenting.” Just as we do in our home, Jean Van’t Hul encourages science experiments, nature walks, baking, pretend play, and more. 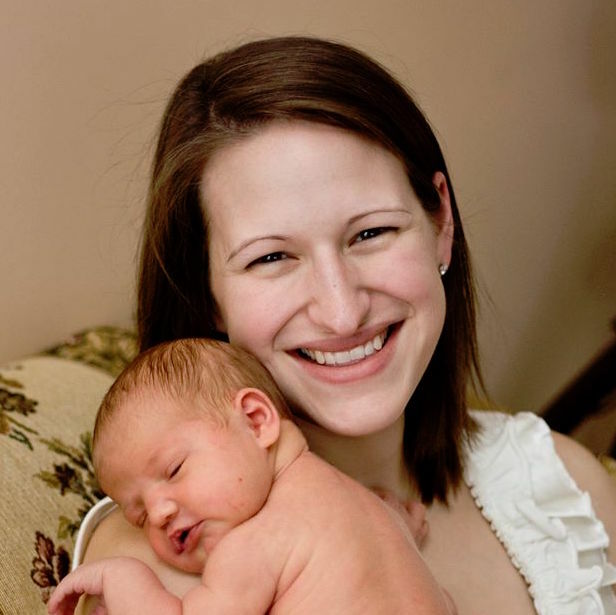 She is thorough in her description of what art can and might look like at home, as well as the developmental stages that children pass through as they grow. Her knowledge of the many benefits of inviting art into your home allowed me the freedom to enjoy each stage of our children’s development, from scribbling to detailed drawing. I feel that this is a wonderful resource for all families, but especially those who are keen on living an artful life with their children. Not only will you be inspired in your journey, but you will also be provided with over 40 amazing activities to make with your little ones. The introduction to this book is simply amazing: “In my opinion, we are all artists. We build our lives from scratch. We work with what we are given. We experiment, we express ourselves, we problem solve…Each and every day is a new creation, never the same as the day before. We are original. We are artists.” Barbara Rucci takes you through the steps of creating your art space and gathering materials with plenty of beautiful images to inspire you. Throughout the book you will find many ideas to inspire creativity within your children and to fill your days with beauty! This is the book to have for creative innovators and artists. Anne Carey and the other contributors have put together an amazing collection of cross-disciplinary projects to inspire your children! It contains over 50 ideas to engage children in science, technology, engineering, art, and math. Each activity is presented with step-by-step instructions, as well as being labelled with the level of difficulty to assist you in choosing appropriate lessons for your child(ren). I feel that this text will be used often in our home for years to come. Having one or more (or all!) 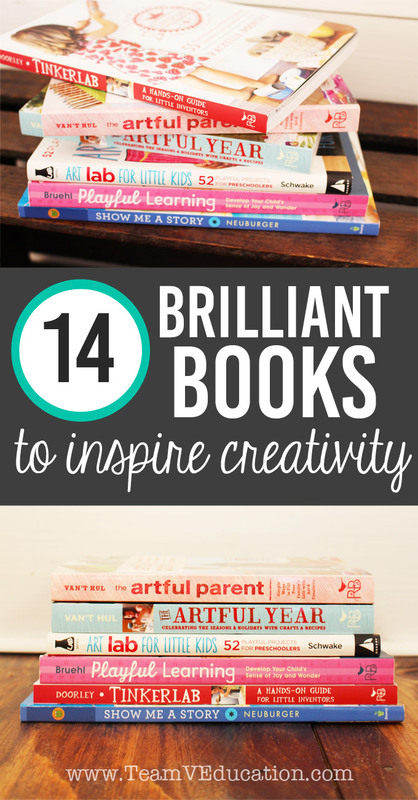 of these books at hand to support creative learning helps us greatly in our planning. I know that when my children are approaching a new developmental milestone in their writing, I can rely on my Playful Learning book to provide ideas to extend their learning. If they are interested in science activities, I have several resources to support learning in the home and outside. And our budding artists have access to art supplies for their own exploration, or I can guide their learning with the ideas from one of the artistic books listed above. I enjoy having the support of these creative educators in the form of their books, right here at home. Go ahead and take a look, because chances are, you will enjoy their brilliant ideas and projects as well!